SAMUEL SMITH. Book. 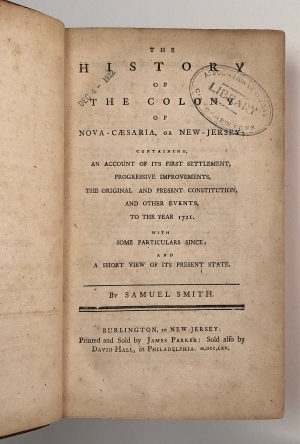 The History of the Colony of Nova-Caesaria, or New-Jersey: Containing, An Account of its First Settlement, Progressive Improvements, The Original and Present Constitution, and Other Events, to the Year 1721, First edition. Burlington, NJ: James Parker, 1765. Henry Remsen’s ownership signatures to front and rear blanks. 573 pp., 8½ x 5 in. During the English Civil War, Sir George Carteret, the Governor of the Isle of Jersey, sheltered King Charles I’s young son, the future Charles II and defended the island for the royal family. Because of their loyalty to the crown, James, the Duke of York, in 1664 granted to Carteret and John Lord Berkeley a tract of land between the Hudson River and the Delaware River, “which said tract of land is hereafter to be called by the name or names of New Caeserea or New Jersey.” The English believed at the time that the Isle of Jersey derived its name from Caesarea, named in honor of the Roman Caesar. In the mid-eighteenth century, Quaker merchant Samuel Smith gathered information and documents to prepare the first history of the colony from its first settlement to the year 1721 with some details on its current condition when he published his history in 1765. Publisher James Parker had served in an indenture to a printer in New York City before joining Benjamin Franklin as a journeyman in Philadelphia. Later, Franklin provided funds for Parker to open a printing establishment and begin a newspaper in New York City. Parker later expanded his printing operations into New Jersey and Connecticut. 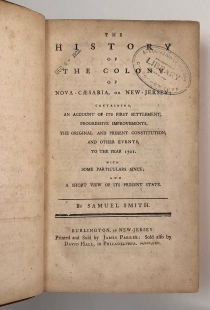 Around 1758, Parker told Samuel Smith that if Smith had Parker print his book on the history of New Jersey, he would print it in Smith’s hometown of Burlington, New Jersey. In 1748, Benjamin Franklin provided a press for use by his apprentice Thomas Smith in Antgua. When Smith died in 1752, Franklin’s nephew and Parker’s former apprentice, Benjamin Mecom, took charge of printing in Antigua. Mecom left Antigua for Boston in 1756, and a year later had the press shipped and continued to use it until 1762. It was stored in New York from 1763 to 1765. In March 1765, Parker wrote to Franklin that he had shipped Mecom’s press from his storeroom in New York by water to Philadelphia “in order that they might not be bruised by Land Carriage.” From Philadelphia, Parker had the press shipped to Burlington, New Jersey, to fulfill his promise to Smith. By late April, Parker reported to Franklin that he had received and set up the press in Burlington, specifically to print Samuel Smith’s History of New-Jersey. He had also hoped to publish a newspaper in Burlington, but “the News of the killing Stamp, has struck a deadly Blow to all my Hopes on that Head.” In June, Parker wrote Franklin that he planned to produce 600 copies of Smith’s book on between 25 and 30 octavo (8-page) sheets for each copy. Parker had hoped to purchase the press from Franklin, but “the fatal Black-Act lately passed, must render printing of very little Consequence; so that I think I cannot afford to purchase them.... I had rather pay for the Use of them, in printing this Book.” By August, Parker was able to report that “about one Half” of Smith’s book had been printed but was interrupted by some printing that Parker needed to do for the colonial government. When Parker finished printing Smith’s book in December 1765, he sent the press to Franklin’s old house in Philadelphia, where William Goddard used it to print the Pennsylvania Chronicle until 1774. Samuel Smith (1720-1776) was born in Burlington, New Jersey, into a Quaker family. Educated at home, he became a merchant in Philadelphia. He later returned to Burlington, from which he served on New Jersey’s Council from 1763 to 1775, under Governor William Franklin, son of Benjamin Franklin. Smith also served as the treasurer for the Western Division of New Jersey from 1750 to 1775. He collected materials for histories of New Jersey and Pennsylvania, and published the first general history of New Jersey in 1765. 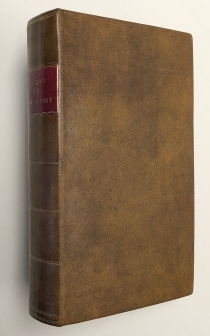 He died before he could publish his History of the Province of Pennsylvania, the second part of which was published in 1830-1831, and the first part not until 1915 from Smith’s manuscript. James Parker (1714-1770) was born in New Jersey and indentured himself to a printer in New York City from 1727 to 1735. He ran away less than two years before his indenture ended and went to Philadelphia, where he started working for Benjamin Franklin as a journeyman printer. At Franklin’s insistence, Parker returned to New York to complete his indenture with penalties, then returned to Philadelphia. There, he lived with Franklin for several years before Franklin agreed in 1741 to finance Parker’s printing business in New York City. Parker established a newspaper titled the New-York Gazette and Weekly Post-Boy, and eventually became the official printer for the King of England the government of the New York province. In the 1750s, Parker established the first permanent printing shop in New Jersey in Woodbridge. He later founded the Constitutional Courant, the first newspaper in New Jersey, and also opened a printing office in Burlington, New Jersey. In addition to New York and New Jersey, Parker also had printing interests in Connecticut. Henry Remsen (1736-1792) was a New York merchant who dealt in dry goods. After the British occupation of New York, Remsen took his family to Morristown, New Jersey. He spoke both Low Dutch and French and translated Low Dutch for Congress in the 1780s. His son Henry Remsen Jr. served as chief clerk in the Department of Foreign Affairs during the Confederation period and as chief clerk in the State Department in the new federal government. Stamp to title, some toning, overall a clean copy and rebound to style. Church 1053; Evans 10166; Felcone New Jersey Books 243; Howes S661; Miller Benjamin Franklin’s Philadelphia Printing 853; Streeter Sale 923. James Parker to Benjamin Franklin, March 22, 1765. James Parker to Benjamin Franklin, April 25, 1765. The “killing Stamp” is the Stamp Act of 1765, which went into effect on November 1, 1765, and was repealed on March 18, 1766. It would have been applied to all colonial newspapers. James Parker to Benjamin Franklin, June 14, 1765. The “fatal Black-Act” to which Parker refers is the Stamp Act of 1765. James Parker to Benjamin Franklin, August 8, 1765; James Parker to Benjamin Franklin, December 20, 1765. The Pennsylvania Gazette (Philadelphia), October 31, 1765, 1:1; February 5, 1767, 2:3.